Here’s a joke for you. Why did the students eat their homework? 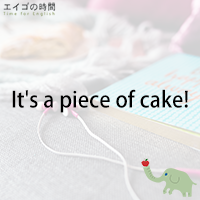 Because the teacher said (that) it was a piece of cake. Did you get it? You can find an idiom in this joke. A piece of cake is something that is easy to achieve. If something is a piece of cake, it’s extremely easy to do. It’s a no-brainer. It’s a breeze. You can use jokes to learn common sayings and idioms in English. Let me give you some examples. What happens when you throw your clock out the window? Time flies. Why are the baby strawberries crying? Because their parents are in a jam. A horse goes into a bar and the bartender says “Why the long face?” Time flies. Be in a jam. Long face. If you know what they mean, you can laugh. 2. you need someone to help you do it. 3. you can achieve it easily. Next Post 浮かない顔 – Why the long face?